The Big Data marketing campaign distracts us from our greatest opportunities involving data. As we chase the latest Big Data technologies to increase volume, velocity, and variety (the 3 V’s), we will never resolve the fundamental roadblocks that have been plaguing us all along. I’ve written a great deal over the last few years about the fundamental skills of data sensemaking and communication that are needed to evolve from the Data Age in which we live to the Information Age of our dreams. It is essential that we develop these basic skills, but we must face many other concerns and resolve them as well before collecting more data faster and in greater variety will matter. I recently wrote about one of those concerns in a blog post titled Big Data Disaster about the problems created by credit bureaus that shroud their scoring methodologies in mystery and have largely ignored their responsibility to base credit ratings on accurate data. We have a right to know how these bureaus determine our credit worthiness and we should never be denied opportunities due to data errors that they haven’t seriously attempted to prevent or correct. Today, I want to raise another important concern about data: the suppression of data of interest to the public. I believe in data transparency. Information that concerns us-especially that which can make the difference between health and illness, life and death-should not be held hostage and hidden. This is an ethical issue concerning our use of data. Pharmaceutical companies routinely suppress the results of unfavorable clinical trials. They even make it difficult in many cases to know that those trials were ever conducted. This results not only in a great deal of wasted research to repeatedly find what was already discovered and hidden, but also in lost lives and false hope. This suppression of data should be criminal, but it isn’t. It is, however, deeply wrong. 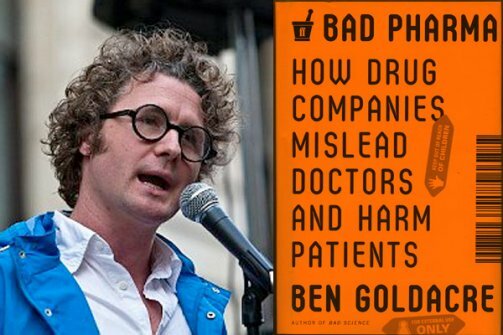 While teaching my workshop recently in London, one of my students recommended that I read a new book titled Bad Pharma by Ben Goldacre. She did so, she said, because she saw Goldacre and me as similar in our willingness to speak out against wrong. I speak out mostly against data sensemaking technologies that fail to deliver useful functionality, but Goldacre, a medical doctor, is speaking out against a systemic problem in the pharmaceutical industry, which involves regulatory agencies, publications, and academic institutions as well. What he reveals, all based on well-documented facts, is chilling. It is an incredible example of science at its worst. Good science has been perverted on an industrial scale. Goldacre documents the problem and its effects in great detail and goes on to describe with equal clarity what we can do to correct it. If we wish to usher in a true information age, we must first develop an ethical approach to data, its dissemination, and use. What Goldacre reveals about the pharmaceutical industry is but one example of data being selfishly and harmfully held hostage by powerful organizations. Problems like this will go unresolved and, in fact, will never even be addressed, if we’re spending all of our time chasing Big Data. First things first; let’s learn to use data responsibly. Pardon my poor attitude, but I don’t know which is a more hopeless cause; trying to get industry and academia to agree on standards for data gathering and use, or trying to educate the majority of alert citizens in the proper use of statistics and data. Ben has been on a campaign against Bad Science for some time now (he published a book with that title back in 2008, and has a blog – http://www.badscience.net – on the same theme). He’s a superb advocate for responsible, and sensible, use of data (amongst other things). I encourage all to check out All the Trials, and to sign the petition. The list of supporters is already quite impressive, including among them the Royal Society of Medicine, the Cochrane Collaboration and several governmental agencies. The day when I believe, as you do, that helping people progress in these ways is hopeless is the day that I will end my work and find a place to spend my remaining time in seclusion. Your attitude, although understandably pessimistic, is indeed poor given the need for resolve and action, despite the challenges that we face. Perhaps we don’t need to “educate the majority.” If we can reach even a few, we should do what we can. The main issue with medicine and medical care in the United States is the pursuit of corporate profits. For many years doctors and hospitals have lead consumers down a path of multiple tests to confirm a doctors diagnosis, or numerous procedures, and or medications to solve health issues. The lack of transparency in trial data shouldn’t be a big surprise. The data is the key, and I applaud Goldacre for trying to expose the truth. I find it very interesting that in the world of big data, the only data most corporations a really interested in deal with purchasing habits. I really hate when people make it their goal to ‘hide’ the truth — by biasing the data (selectively not giving you all the data, designing survey questions to get the results they want, etc), or by giving you “too much” data. Unfortunatly, it seems like people are rewarded for “lying with data”, rather than rewarded for finding the truth in the data. Thanks for the review. Another book I’ve added to my wish-list that you’ve positively reviewed. I can also thoroughly recommend Goldacre’s first book “Bad Science”. It provides some jaw-dropping insights into the medical industry. Very interesting discussion. Regarding how science can be messed up with, I strongly recommend reading “Wrong: Why Experts Keep Failing Us” by David H. Freedman. It is both a fascinating and chilling book. Another book in just the same direction, possibly with even more credibility of the author, is Marcia Angell’s book, “The Truth About the Drug Companies: How They Deceive Us and What to Do About It”. Marcia Angell was the editor of one of the most renowned medical journals, The New England Journal of Medicine, for some 20 years.